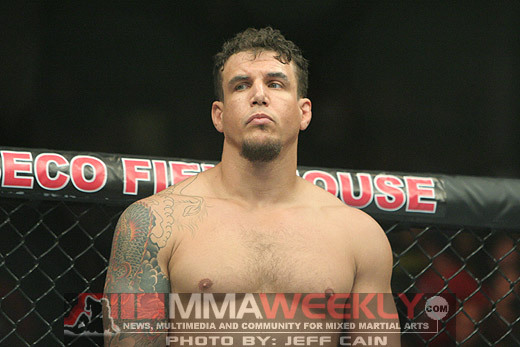 A fight between former UFC heavyweight champion Frank Mir and “Ultimate Fighter Season 10” runner-up Brendan Schaub is in the works for early 2011. According to sources speaking to MMAWeekly.com, the bout between Mir and Schaub has at least reached verbal agreements, although no bout agreements have been issued at this point. Mir vs. Schaub would likely end up on one of the cards in early 2011, but an exact date has not been verified. The match-up between Schaub and Mir locks up the fact that the former heavyweight champion will not be facing Brock Lesnar in a trilogy fight. UFC president Dana White had talked about the match-up, but then backed off when fans on his Twitter page seemed lukewarm about the idea of a third fight between the two heavyweights. Since his win over Gabriel Gonzaga at UFC 121, Schaub has made no secret of his desire to face Mir. “If the UFC calls, I’m up for whatever they ask me to do… but I did say I think that next step up from Gonzaga would be a guy like Frank Mir or (Mirko “Cro Cop” Filipovic). For me, that’s kind of headed in the direction of getting closer to the title,” Schaub told MMAWeekly Radio after his win in October. It looks like Schaub got his match-up. As for Mir, the former champion is coming off a win over Mirko “Cro Cop” Filipovic back in September, but not without some criticism for a fairly lackluster fight until landing the knockout blow late in the third round. Mir is 2-1 in his last three fights, and looks to climb back up the heavyweight ladder towards a title shot and faces a tough test in Schaub. Following the fight with Cro Cop, Mir seemed up for any challenge the UFC presented him, including the fight with Schaub. Most of the major fights have been filled for cards up to the end of February, and a heavyweight bout like this one will get a major slot on an upcoming show, but no confirmation has been given as to which show it might end up on.